The National Waco Club was founded in 1958 by a small group of six Waco enthusiasts who felt that they should have some type of organization to support their hobby and love of owning and flying Waco airplanes. One of the key members of this group was Raymond H. Brandly. Ray Brandly was a B-17 pilot who had come home to Dayton, Ohio after WWII and resumed flying after a 10-year hiatus at what was known as South Dayton Airport. Ray became interested in Waco airplanes when he and several others went together and purchased a 1941 Waco UPF-7 in the mid-fifties. Ray was so smitten with Wacos that he soon purchased several more. The Waco Aircraft Company in Troy, Ohio was still in business, although they were no longer building aircraft. Ray quickly became acquainted with President Clayton Bruckner and a lifetime friendship evolved. Waco had always maintained that no Waco airplane would ever have to want for a spare or replacement part. Consequently, there existed a large inventory of new parts for practically every model of Waco airplane that had been built. It was decided that the handling of these parts for purposes of sale to customers, would not justify the time or expense involved. In October of 1957, Mr. Bruckner approved the sale of these parts to Ray Brandly, never suspecting a movement would soon be underway to restore the many forgotten and sadly neglected Waco airplanes that were still a common sight at many airports around the country. This brings us to the Antique Airplane Association gathering in 1958 at Ottumwa, Iowa. 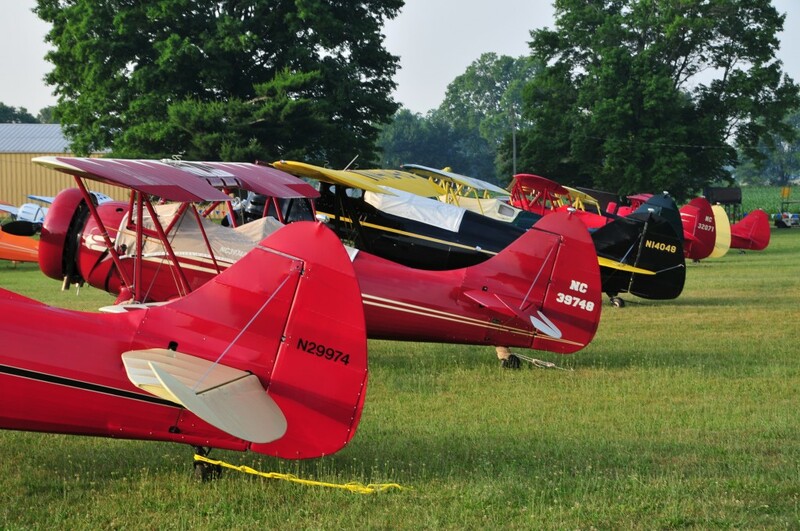 After a sunny day of flying and great camaraderie with the other antique airplane enthusiasts, the Waco owners got together and decided to form a club. Since Ray was the go-to man for Waco parts, he naturally was chosen to lead the club. Ray and the other owners went home and soon Ray was receiving letters and phone calls from other Waco owners across the country, simply by word of mouth. It was soon decided that the club needed a newsletter and Ray took on that responsibility as well. In addition to the newsletter, the National Waco Club became formally recognized by the Antique Airplane Association and Ray would write a monthly article for their magazine on what was happening in the world of Wacos. The First NWC Fly In, South Dayton Airport (now Moraine I73), OH, 1959. It was decided that in 1959, the National Waco Club would host their first gathering at the new South Dayton Airport (moved 2 miles from old location around 1957). The first gathering was a grand event with approximately 10 Wacos attending. 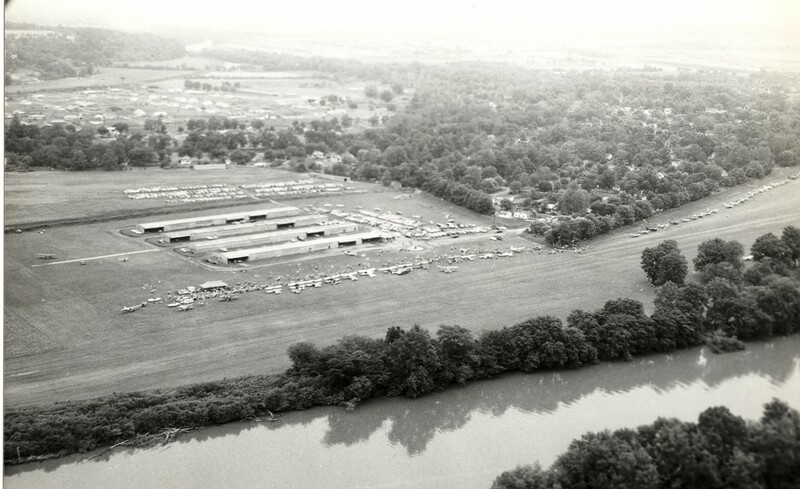 Over the next few years, the National Waco Club held their annual reunions at several locations, including the Waco Aircraft Company in Troy, Ohio in 1963-65. The Club formally moved the National Fly-in to Hamilton, Ohio in 1970. The airport at Hamilton, Ohio was one of the oldest airports in Ohio, continuously owned and operated by the Hogan family since the late 1920’s. The National Fly-in was held at this location from 1970-1988, when the county purchased the airport. During the early years, the National Waco Club allowed several other “Type Clubs”, namely the Beechcraft Staggerwing and Stinson Gullwing Clubs, to hold their National gatherings in conjunction with the National Waco Club. What a sight that was to see three of the finest airplanes built all together at one location. By the late 1980’s we routinely had close to forty Wacos attending every gathering. The decision was made to move the National Waco Club Fly-in to Wynkoop Airport in Mt. Vernon, Ohio for 1989. Wynkoop Airport is a beautiful, all-grass airport that has been run by the Wynkoop family since the late 1940’s. Owner Brian Wynkoop was more then happy to offer his airport to the National Waco Club and a friendship with the Club evolved and still continues to this day. NWC 50th Reunion, Wynkoop Airport (6G4), Mt. Vernon, OH, 2009. As the years passed on and the Club grew larger and larger (over 600 members in the late 1980’s), Ray felt that he needed help. In the early 1990’s, Waco restorer Wayne Hayes moved to Mt. Vernon from New Jersey to set up a total Waco rebuilding facility and became part of the driving force to keep the National Fly-in at Mt. Vernon. 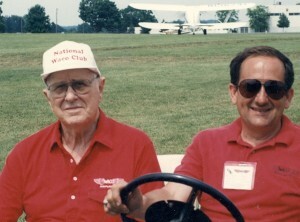 Wayne took over responsibility of running the Fly-in while Ray ran the Club. Unfortunately, Wayne suffered some medical setbacks and soon was unable to do all the work himself. At this point, Ray asked Pete Heins if he would help him run the National Fly-in. For two years, Pete helped Ray with the Fly-in and helped make the gathering even more successful. At the same time, brother Andy Heins and life-long Waco friend Doug Parsons came on-board to help Pete. In the fall of 1996, Pete, Andy and Doug were asked to come to Ray’s home for a visit and to discuss the coming year’s Fly-in. During the discussion, Ray again asked if they would help with the Fly-in and then asked if Andy would help with the newsletter. Within two months of the conversation, we received a call that Ray had passed away and the family wanted to know if we would consider taking over the Club completely. Since all three had grown up with Wacos, the only answer to the question was a resounding “YES”. Due to business obligations, Pete quickly pointed out that he could help with the Fly-in, but simply did not have the time to write a newsletter. The same went for Doug, who had obligations flying for a major airline and simply was not home enough to handle Club correspondence. That left Andy, who also worked for a Commuter airline, but had the time and ambition to handle what was needed in order to keep the Club running. It was quickly decided that Andy would run the Club and Pete and Doug would handle the Fly-in. Wacos parked near the Grove at Wynkoop Airport (6G4), Mt. Vernon, OH. Since that time, many things have changed. Andy continues to run the day to day business with the Club. Doug is now totally in charge of the National Reunion. Pete had to relinquish his role but is still an active supporter and attends every year in his 1930 Waco CRG. The newsletter went from four pages to twelve, mailed bi-monthly. Every National Reunion now has a free early-bird cookout and a free Corn Boil for all attending members. Participation awards are given to every pilot flying a Waco to the Reunion. A fund-raiser auction is held every year at the Reunion following the banquet. We now have owner-operator forums on Friday and Saturday at the Reunion on such topics as restoration, aircraft coverings and products, engine overhauls, etc. The Club also maintains the largest collection of Waco photos in the U.S., as well as a huge collection of manuals and brochures, all available to Club members. We also maintain the largest, complete database listing of every Waco ever built (excluding Troop Gliders) from 1921-1946 with such information as models, serial numbers, registration numbers, dates built, original purchasers, and any other pertinent information available. The National Waco Club is recognized as the oldest “Type Club” in the United States. Membership is open to anyone with a love for Waco airplanes, be it a current owner, former owner, employee, or anyone who appreciates the beautiful airplanes built by the Waco Aircraft Company.